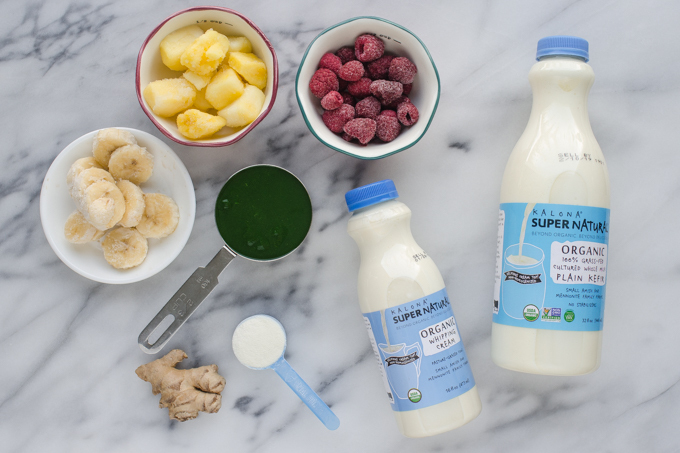 These kefir smoothie recipes combine some awesome ingredients to make a delicious and nutritious breakfast! One of my favorite things to make for breakfast is smoothies. 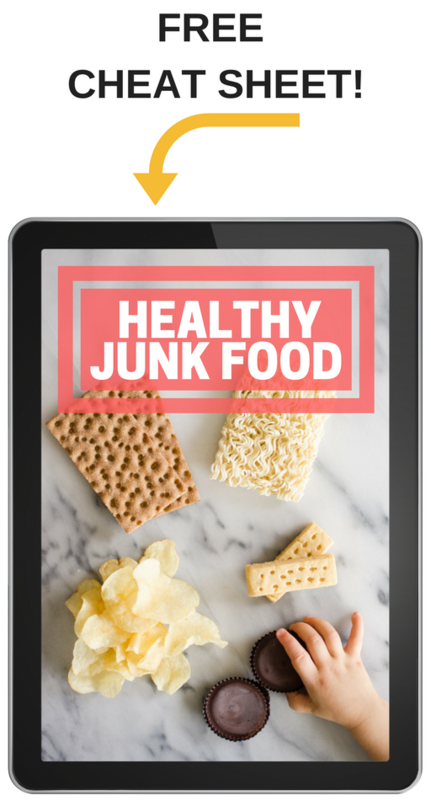 Not only are they delicious and refreshing, they allow you to pack a bunch of nutrient-dense foods all into one meal. It’s a great way to kickstart your day. 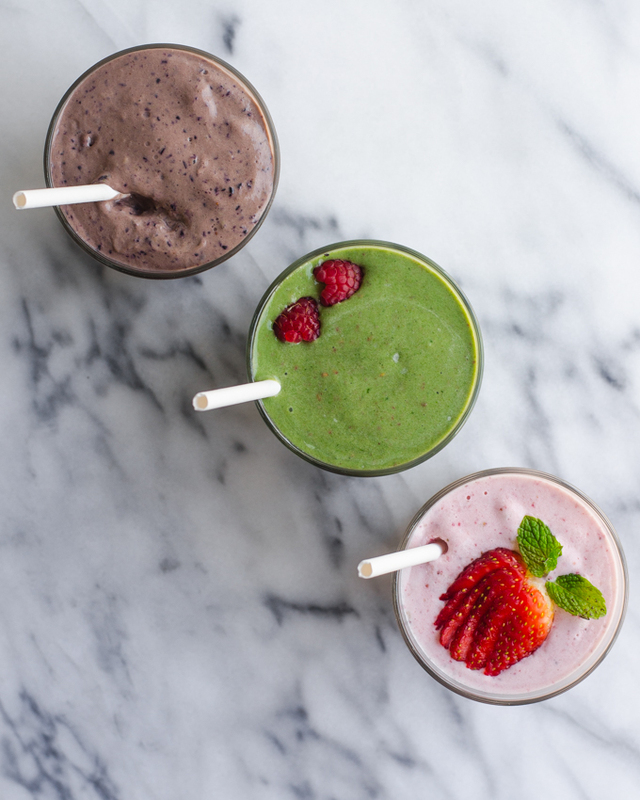 Today I’m sharing three healthy smoothie recipes that have very different flavor profiles despite having a common base ingredient! 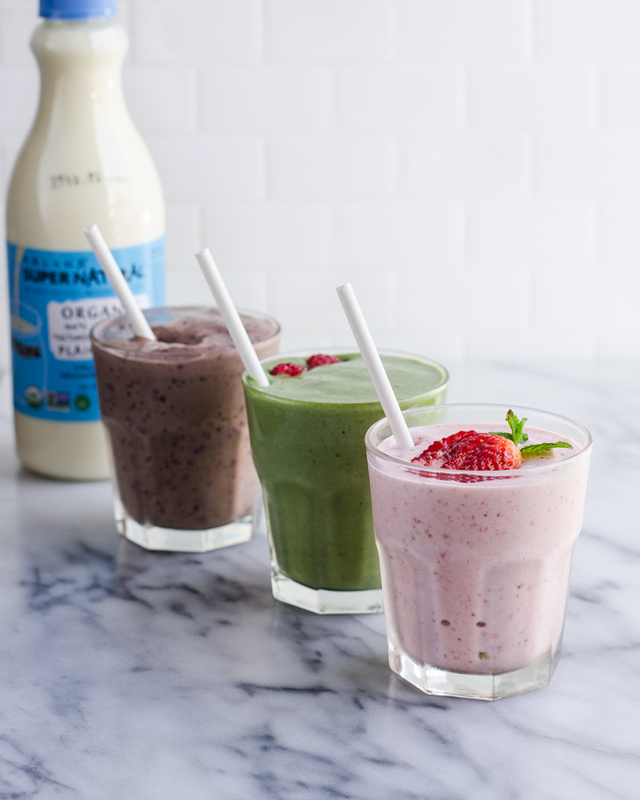 All three of these smoothies contain an amazing ingredient that I consider a superfood: Kefir! What exactly is kefir, you ask? 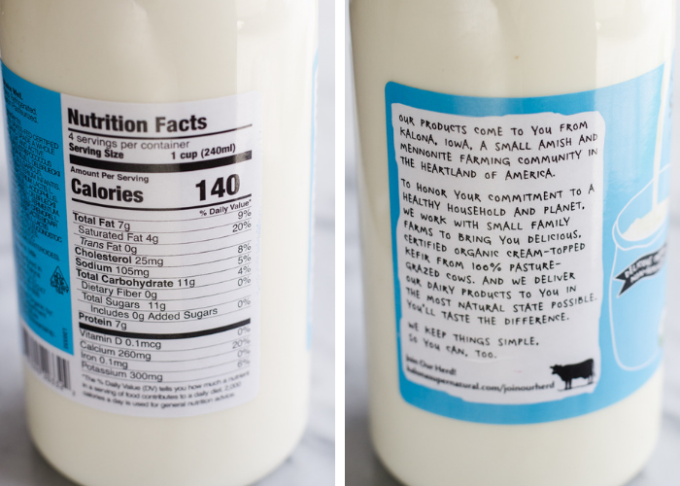 It’s basically milk that has been cultured with beneficial probiotics. Kefir is kind of like yogurt’s cousin. It’s usually less thick than yogurt, and lends itself nicely to drinks. 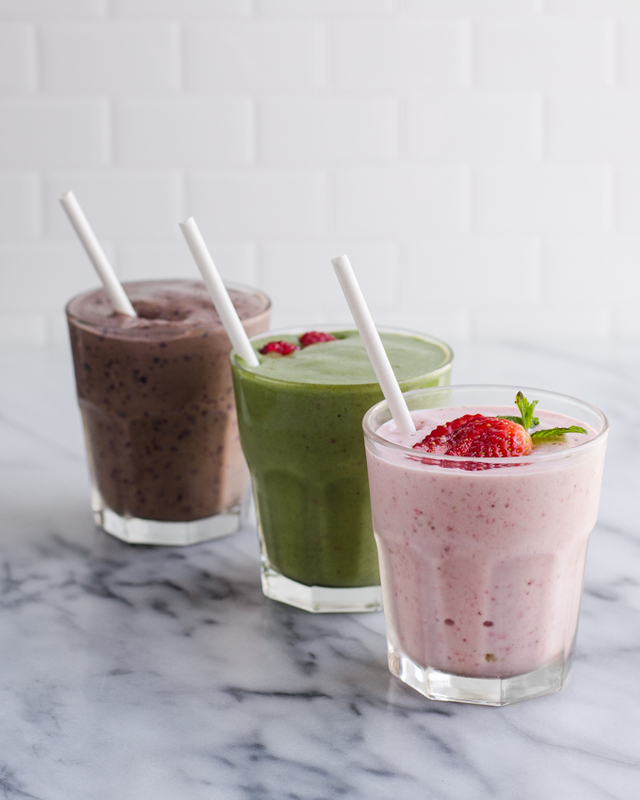 Like smoothies! 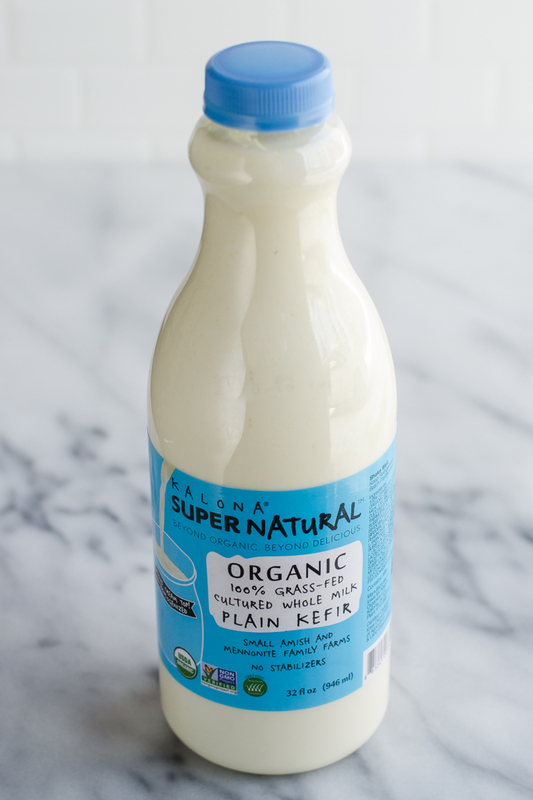 Kalona SuperNatural is definitely my favorite store-bought kefir. 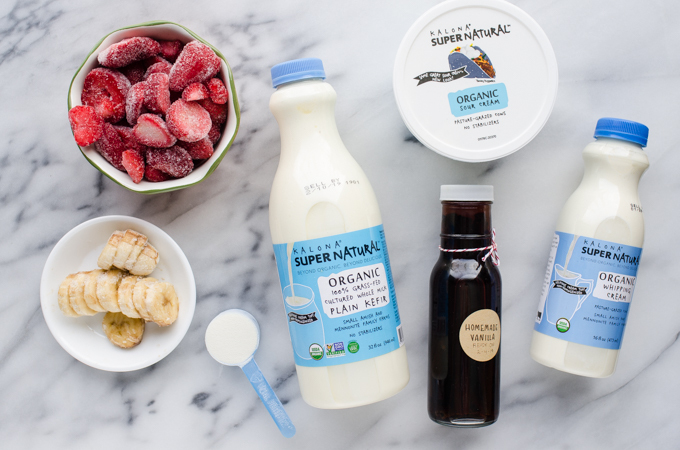 It’s one of the few brands that make real-deal full-fat kefir. Another rarity: it’s non-homogenized! It also doesn’t contain any stabilizers (it’s full-fat so it doesn’t need any!). To top it all off, it’s certified 100% grass-fed. But I wouldn’t be as excited about this kefir if it didn’t taste good, too! I love that it’s creamy and mild – not overly sour! 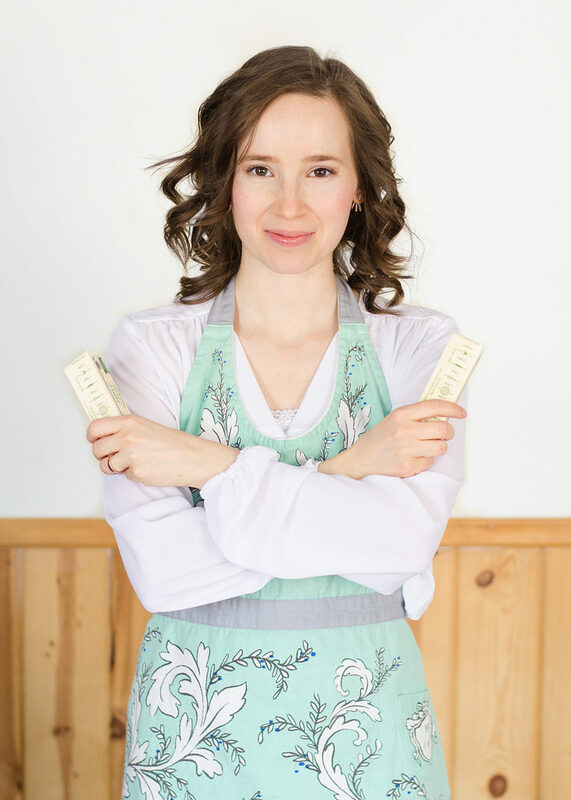 Now, let’s jump in and I’ll show you some awesome smoothies that you can make with kefir! 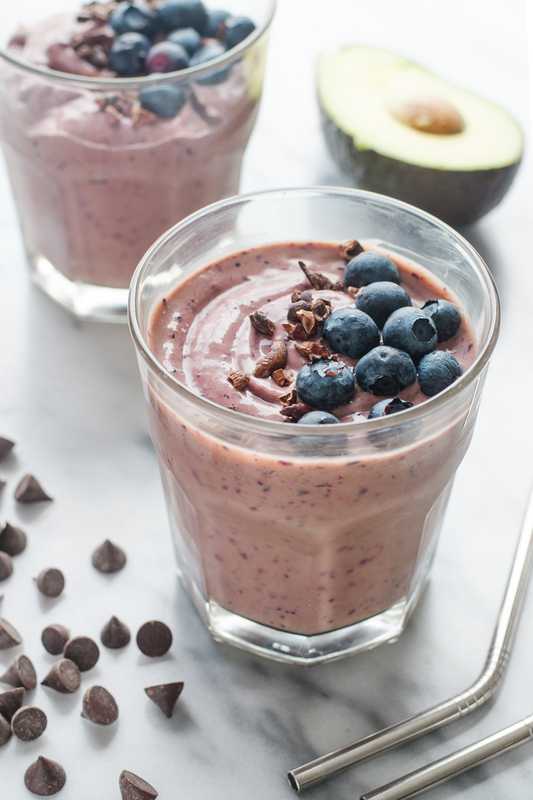 First up, we have this delicious Blueberry Chocolate Smoothie. This flavor is my kids’ favorite of the three because: CHOCOLATE. 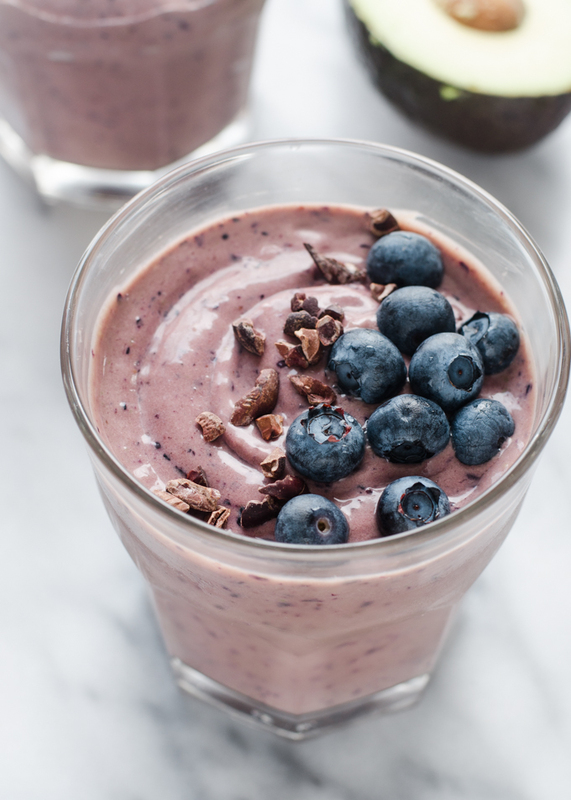 Here’s everything you’ll need to make this smoothie: frozen blueberries, unsweetened cocoa powder, vanilla extract, cream, frozen bananas, half of an avocado, and kefir. 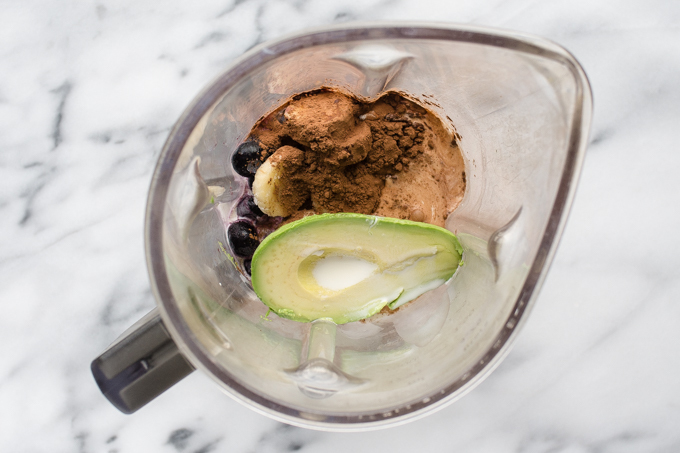 Place everything in the blender and give it a whirl! It’s amazing how well these flavors play together! 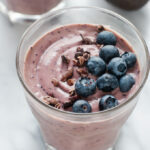 I hadn’t tried blueberries and chocolate as a combination for smoothies before, but it’s really good! The avocado adds some healthy fats and creaminess, and the kefir lends and bit of tang to the situation. Yum! 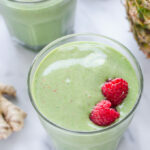 Up next we have this Green Superfood Smoothie. This is great for those days when you’re craving something fresh, or you need to round out your greens quota. 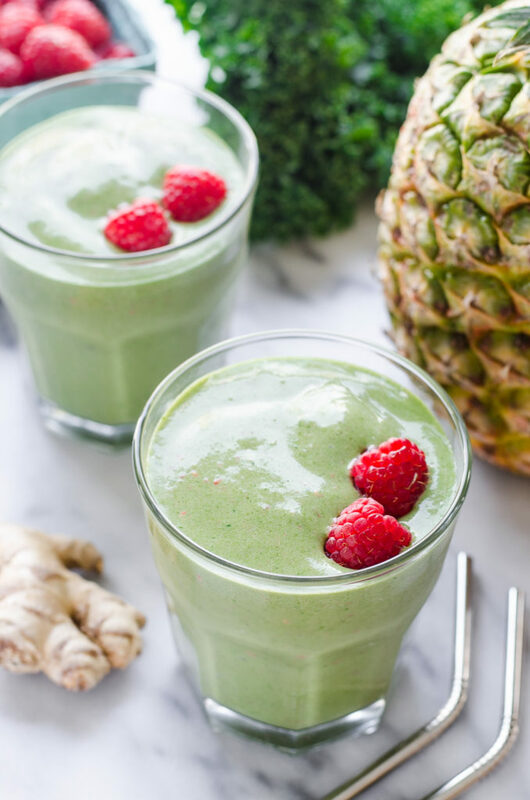 Here’s are the ingredients you’ll need: bananas, pineapple, raspberries, kale puree (learn how to make it in this post), ginger, collagen peptides, cream, and kefir. Throw it all in the blender, and away you go! 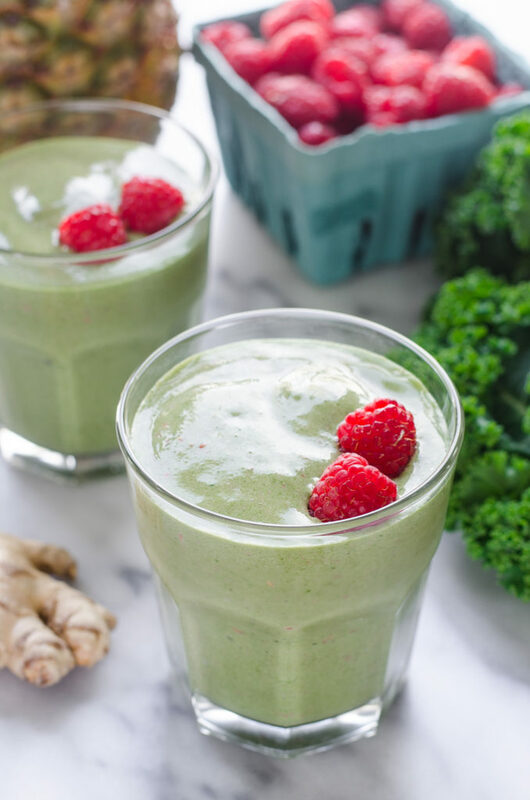 I consider this one a superfood smoothie because it has some powerhouse ingredients: raspberries for antioxidants, kale for vitamin C, more antioxidants, and anti-cancer properties, ginger for an immune boost, collagen peptides for joint health and protein, and kefir for healthy fats and good probiotics. 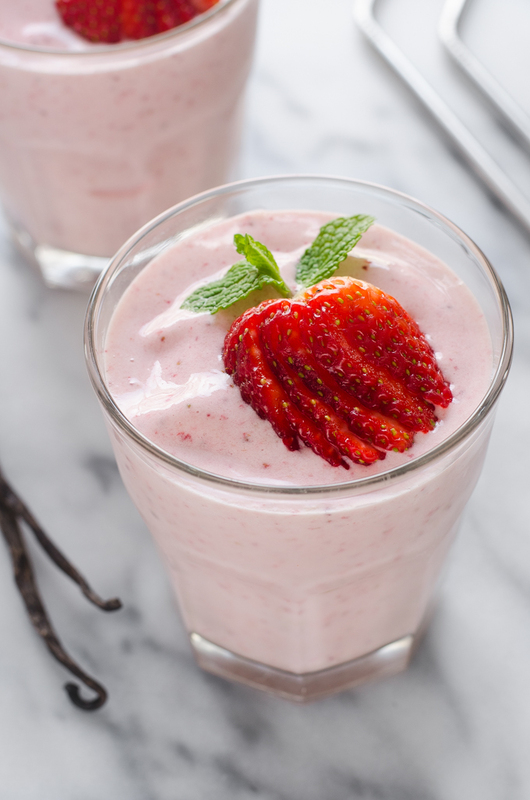 If you’re looking for a delicious but healthy treat, this Strawberry Cheesecake Smoothie fits the bill. It’s completely naturally sweetened, and tastes like a milkshake! 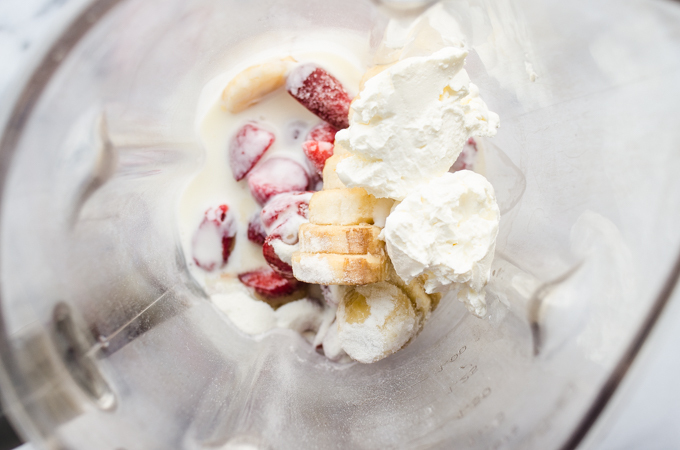 All you need is frozen bananas and strawberries, collagen peptides, sour cream, cream, vanilla extract, and kefir! Again, just plop it all in a blender and whiz it up! 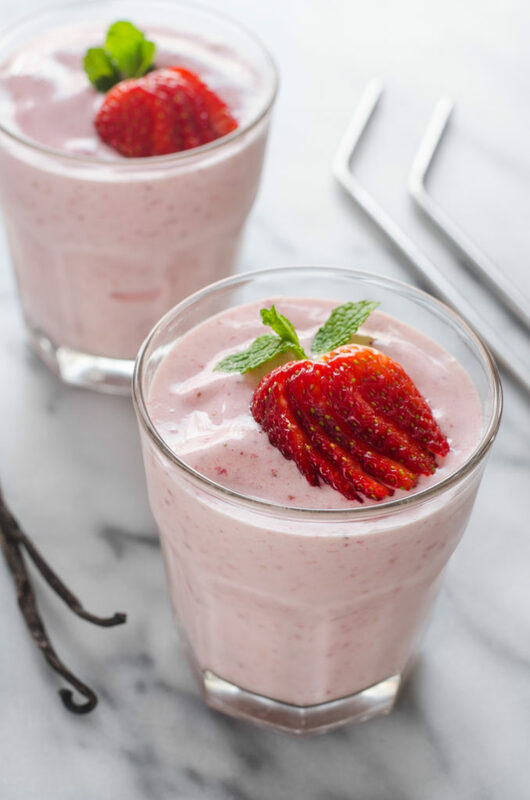 This one’s definitely a kid pleaser – it has mellow flavors, and tastes like a strawberry cheesecake milkshake (without the unhealthy sugar bomb, of course). 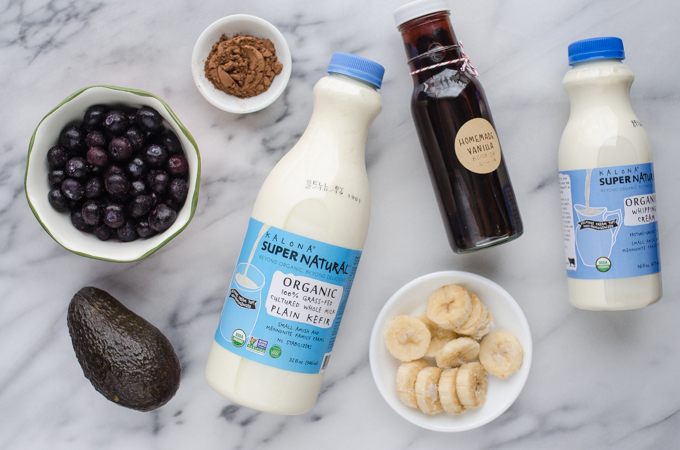 So there you have it: three healthy kefir smoothies you can make to start your day off right. Which flavor would you try first? 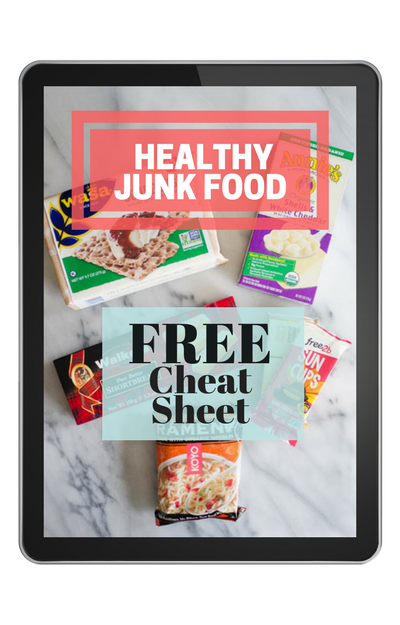 All printable recipes are below! Sounds like a strange combination, but it's delicious! 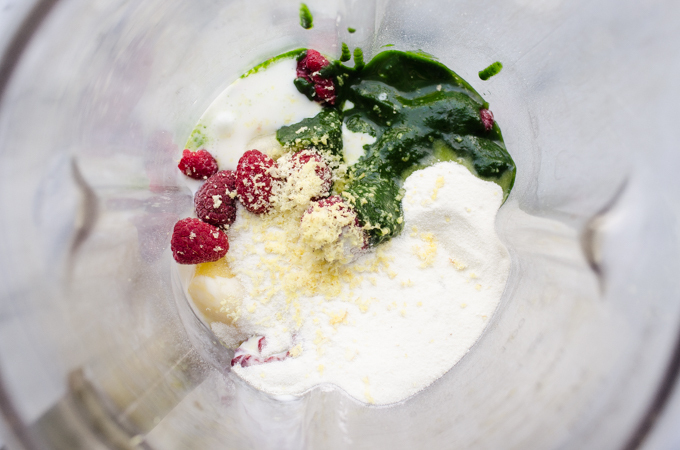 Place all ingredients in a blender and blend until smooth, adding more kefir or cream to achieve desired consistency. Serve immediately. Place all ingredients in a blender and blend until smooth, adding more kefir or cream as needed to achieve desired consistency. Serve immediately. Follow the instructions in this post to make the kale puree. 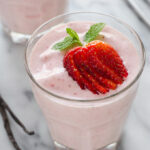 A healthy smoothie that tastes like a strawberry milkshake!